Curve Digital is bringing Hugecalf Studios' extreme take on the puzzle physic construction genre to the Nintendo Switch in early 2019. When Ski Lifts Go Wrong is basically the cooler version of Poly Bridge, in more ways than one. 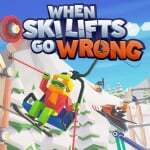 Previously known as Carried Away, the title requires you to guide passengers and riders from one side of the snow to other by constructing ski lifts, jumps, bridges, ramps and more using a variety of materials. The developer promises plenty of creative challenges and hilarious disasters. Take a look at the trailer above and tell us if this is the type of game you've been wanting to play on your Nintendo Switch. (the 2010 Horror film about three teenagers freezing to death on a ski lift). When I see games like this, it makes me wonder who enjoys such intense aggravation. Forget about Silent Hill and Resident Evil... THIS is the kind of game that would give me nightmares. I hear that when skiers go 2000 meters down the mountain, a Yeti jumps out and eats them. Looks neat. An interesting take on the bridge building game. My GF wants to take me skiing with her. I have never done it and this game doesn't make me any less apprehensive about it.